We appreciate your, our readers, feedback. In 2019 we took another 30 mustache waxes and asked 3 professional barbers to test them and choose the top 10. This review will help you to choose the best mustache wax that fit your ‘staches. The winner though is Death Grip Moustache Wax – the mustache wax that fits most types of facial hair. Premium quality mustache wax, handcrafted from a perfect combination of lanolin, bee wax, and other natural ingredients. The product is extremely firm and concentrated, and provides an insanely strong, competition grade hold for the whole day long. Made with pride in Colorado. Do you know the secret to keeping your mustache in tip-top shape, making everyone stop and stare? It’s called mustache wax! Yes, it is actually a care product created exclusively for your mustache, helping it to get in its peak and prime condition! So how you can find the best mustache wax you’ll enjoy using? Mustache wax works to condition your mustache hair to help keep it well-groomed and oiled, sporting the ideal conditions for keeping it long-lasting and supporting its most healthy and successful growth. What Type Of Mustache Will Fit My Face? How To Get A Perfect Mustache? How To Take Care Of Your Mustache? 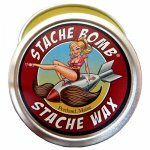 How to Choose the Best Mustache Wax? How To Apply Moustache Wax? Safe, natural ingredients. No petroleum. Compact package. Great for handlebar curls. Superior hold with easy application. It’s important to take a moment to learn about the different types of mustache wax: traditional wax and modern mustache wax/trainer. Traditional mustache wax typically has a petrochemical base like petroleum jelly or mineral oil. This type of wax is known as the old-school approach to tending to your mustache. The only potential downsides to this approach are that you could experience mild skin irritation, clogged pores, and/or acne. Modern mustache wax/trainer is the new approach to mustache up-keep. This method is typically found in the round or rectangular tin cans and a strong majority of them are natural or organically-based which leads to a lower risk of acne breakouts or skin irritations. Check out the label though just in case as sometimes, petrochemicals are still slipped in. Now, let’s take a look at the top mustache waxes that are available to you on the market today! Each of these products can help you achieve mustache greatness. 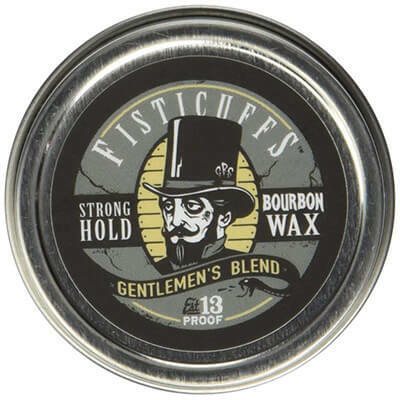 The Fisticuffs Strong Hold Mustache Wax Gentlemen’s Blend is a hand-poured one ounce tin of top quality mustache wax. This modern product maintains a strong hold throughout its use, making it durable and stable for offering tremendous hold to your mustache. It is made of top quality ingredients including beeswax, tea tree oil, jojoba oil, coconut oil, petroleum jelly, and pine sap with some essential oils included as well. The traditional mustache wax is known for offering a tremendous hold. It features a bourbon scent that has sandalwood after notes, making it as pleasing to the nose as it is to the eyes and the mustache. The CanYouHandlebar All-Natural Primary Moustache Wax is ideal for everyday use thanks to its medium hold strength that is easy to use but still strong and long-lasting. This makes for great touch-ups as needed when you are on the go and busy throughout your day. This wax is made from premium ingredients that are safe and natural with nothing hidden in them; there is no petroleum used in the making of this wax. This wax is made only from local beeswax from Michigan bees, USP lanolin, castor oil, coconut oil, shea butter, and vitamin E.
This entire product is made in the USA and the tin itself is made for real life. With its durable and sturdy construction, you can take it with you wherever you need to go! 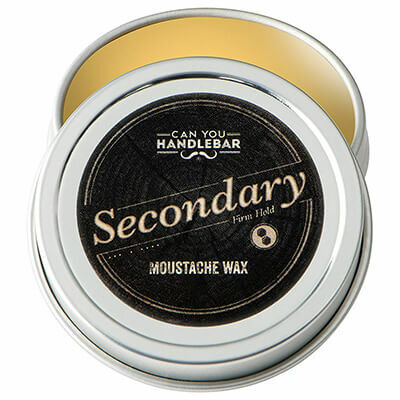 The CanYouHandlebar All-Natural Secondary Moustache Wax: Extra Strength was the number one best seller in mustache waxes last year! This all-natural mustache wax is a modern mustache wax trainer that is made from the most premium ingredients around. It is made in the United States from local Michigan beeswax, USP lanolin, castor oil, coconut oil, shea butter, and vitamin E. Each batch is hand-made, so you know you will be pleased with each tin you buy. This very firm wax offers extra strength to give you extra hold for your entire day. Put it on your mustache first thing in the morning and by the time you get home, even after going out at night, it will still be looking as fresh as new. 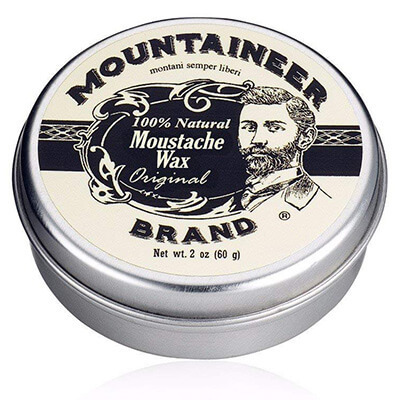 The Mustache Wax by Mountaineer Brand comes in a two-ounce tin, offering you twice as much mustache wax as what it traditionally available with most other brands. This modern mustache wax is made only with the best ingredients around. It’s all natural and does not contain any harmful chemicals or petroleum, so you don’t have to worry about the potential hazard of breaking out with acne or skin irritations. This modern mustache wax trainer is only made with beeswax, natural oils, and essential oils. These ingredients create a high strong hold and are invisible to the eye when putting on the mustache. Even more, this wax offers a mild cedar and fir needle scent that is as fresh as it is relaxing. 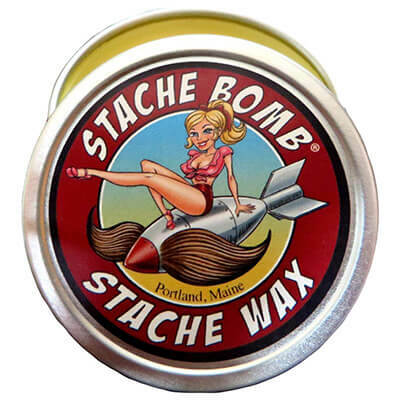 The Stache Bomb Stache Wax Mustache Wax Made In Maine is a mustache wax specifically designed for handlebar mustaches. But it also works great with beards, goatees, and sideburns as well! No matter the facial hair you have, you will enjoy the benefits of this wax. Handmade in Maine, this wax comes complete in a one-ounce tin with a manly pine scent that will add relaxation to your style. Also unique to this wax is that it comes with a Stache Bomb logo guitar pick to use as your mustache wax scraper! 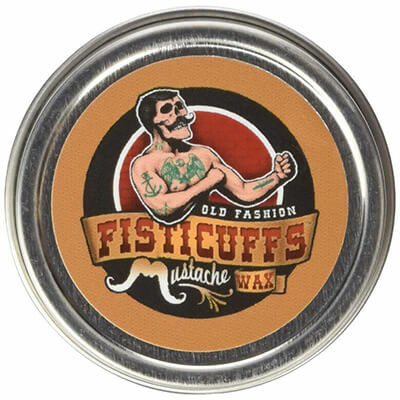 The Fisticuffs Cigar Blend Mustache Wax has a rich cigar scent with vanilla after notes, perfect for the classic gentleman. This traditional mustache wax is made from the finest beeswax, tea tree oil, jojoba oil, coconut oil, petroleum jelly, pine sap, and essential oils that are available today, making this wax superb for all who enjoy it. It is able to offer a very strong hold thanks to the ingredients that make it what it is. Each batch is hand-poured, so you know you will enjoy the quality and dedication that goes into making it. 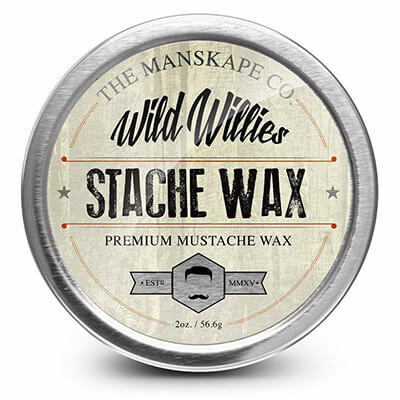 The last mustache wax we are going to take a look at is the Wild Willie’s Mustache Wax. This wax is the only hard wax with seven natural organic ingredients that combine for all day lasting strong hold. It’s made from shea butter, yellow beeswax, sweet almond oil, pine resin, tea tree essential oil, cedarwood essential oil, and rosemary essential oil. 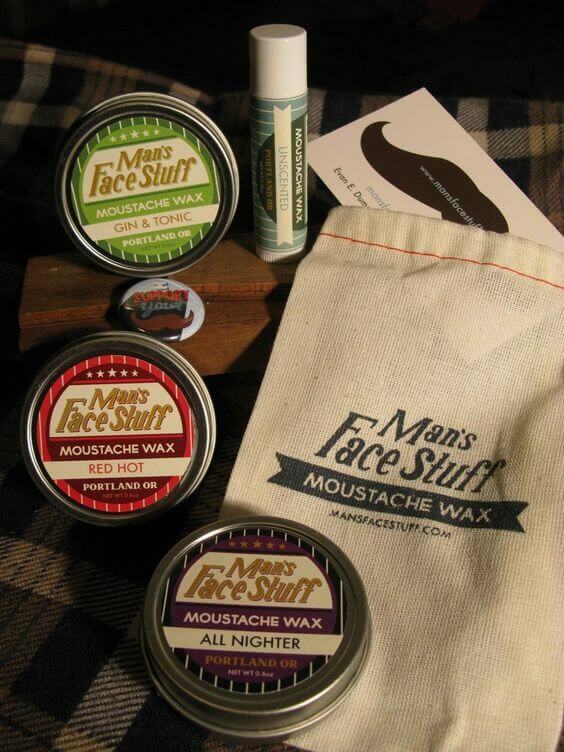 All of these natural ingredients make this modern mustache wax trainer perfect for the modern man. This wax is available in a two-ounce tin, giving you twice as much wax as many of the other waxes that are typically found. Plus, with this natural product, there are no additional chemicals, preservatives, fragrances, or colorants used. So you know you, your body, and your mustache will be benefitting from a product great for your overall health. 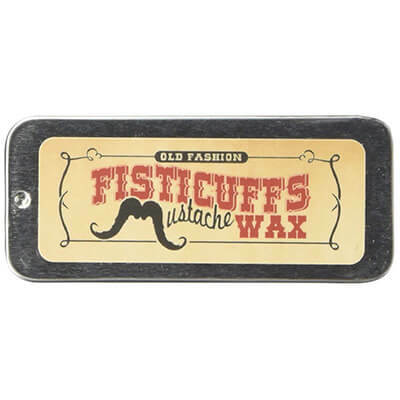 The Fisticuffs Strong Hold Mustache Wax crosses over with many of the same great features as the mustache wax listed above. This traditional wax is made from beeswax, tea tree oil, jojoba oil, coconut oil, and some essential oils along with petroleum jelly and pine sap. 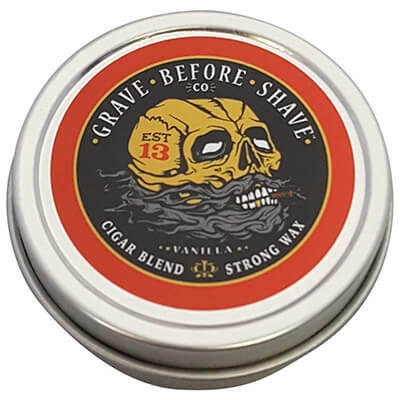 This mustache wax comes complete in a one-ounce tin which will be able to last for a very long time since you don’t need to use a lot at once. It is hand poured and is able to maintain a strong hold for as long as you need thanks to the quality ingredients. Plus, the wonderful citrus scent makes it even more pleasurable to the senses. 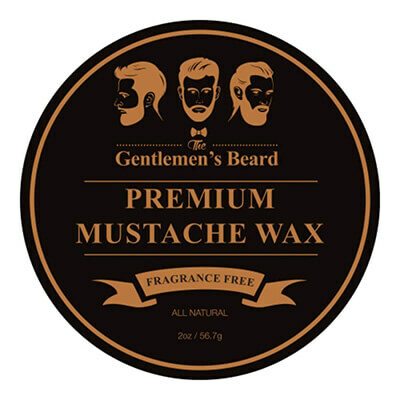 The Gentlemen’s Premium Mustache Wax is a premium mustache wax that is fragrance-free. It offers an all-day hold that is strong enough to keep your mustache perfectly in place for the entire day and the entire evening without giving you feelings of greasiness or stiffness, making it comfortable the whole day through. This hold will help to tame your wildest mustache hairs and will keep you looking sharp as long as you need. This gentlemen’s wax is completely invisible, so you won’t have to worry about making sure it’s always blended into place. It features a modern natural wax that becomes transparent to any color hair, whether black, brown, blonde, or red. 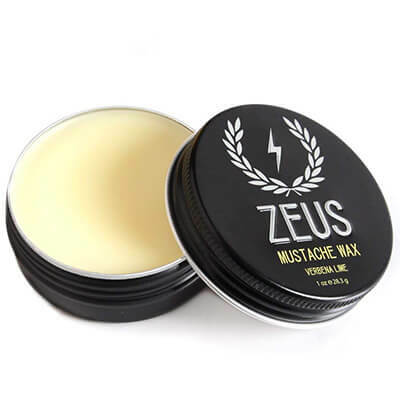 And you only need to use a little bit at a time, so this modern mustache wax will last you for quite some time! 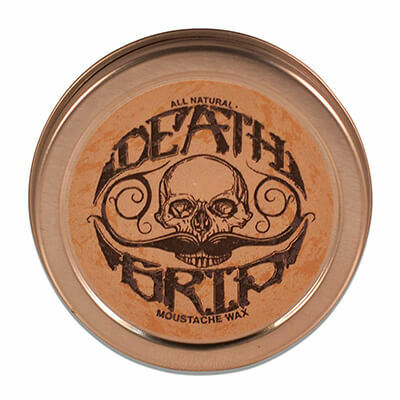 Death Grip Moustache Wax is a bold-firm wax, luxurious competition-grade product. It’s stiff in the tin, but its consistency is similar to that of a thick, sticky pine sap. The wax includes all-natural ingredients such as lanolin, beeswax, and pine gum rosin — the latter of which renders Death Grip literally the tackiest mustache wax available on market. Growing a mustache isn’t for everyone. Sometimes it happens that a particular type of mustache looks good on one person, but the same type doesn’t suit the other. Unfortunately, you cannot tell until you try it. Growing a mustache isn’t difficult at all, but choosing the right type of mustache to grow can be a challenge. The first question that comes to mind when you set out on the quest of growing a beard is, well, what type of mustache will fit your face? Big Nose – If you have a comparatively bigger nose than average, avoid growing a thin mustache as it will certainly not look good on you. Small Nose – Likewise, if you have a smaller nose than the average size, a bushy nose will look odd on your face. Large Features – Those people who have large facial features, such as large eyes, mouth as well as ears, then a bushy mustache is what they need! A thick, bushy mustache will not only give off a softer look, but it will also balance the facial features. Long Face – For people who have a long face, a mustache that falls between narrow to medium thickness range is ideal. With longer faces, avoid growing thick mustaches. Extremely Large Mouth – For those who have been blessed with an extremely large mouth, try growing an angular mustache. The one that perhaps starts off as being narrow at the top and gets bushy towards the bottom. Small Mouth – People with small mouths should always avoid thick, bushy mustaches. However, if you insist, there’s no harm in trying. Once you have decided what type of mustache you want, it’s just a matter of time before you’ll be roaming around with your brand new mustache. There are mainly two ways of growing a mustache. Firstly, you can keep shaving your facial hair while leaving the portion above the upper lip. As for the second way, quit shaving completely for around 2 to 3 weeks and let your facial hair bloom. Once this period has elapsed, you could shave off in whichever manner you deem suitable, depending on the type of mustache you’re after. Once you have grown your mustache and it looks just perfect – your job doesn’t end here. You need to care for your mustache to keep it looking good. Trim as needed – Trimming is important to keep your mustache neat and just the way you want it. Trim off older grown hair as soon as you see any. Use a high-quality trimmer for the best results. Shampoo once in a while – Use shampoo to wash your c in order to keep it nourished and supple. Keep it Clean – Keep your mustache clean by removing any particles such as dust or food. Splash them with water every now and then throughout the day. Use a good Mustache Wax for styling and extra care. Choosing the best mustache wax for you can be a difficult process. However, it’s best to begin by deciding whether you are more interested in a traditional wax or a modern wax as this will guide what types of waxes you want to look for. Then, you can continue by looking at the ingredients used to make up each wax along with the scents, styles, holds, and any and all additional characteristics that make each mustache wax great. Lean into your personal style and interests and you will find the best mustache wax for you. 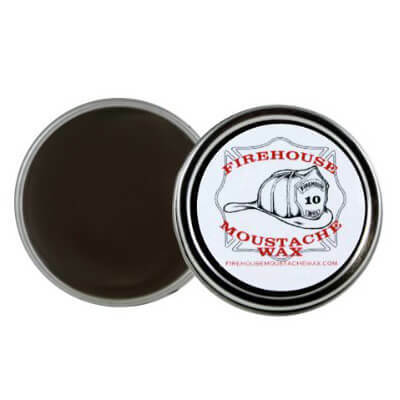 There are many phenomenal mustache waxes available today. By looking at what makes each one special and by knowing what you are looking to gain from you mustache wax. You will be able to find the best mustache wax for you. Start by taking a look at the top mustache waxes listed above, use quality beard & mustache trimmer, and soon you will have the hold and the look of your facial hair that you have been waiting for!